One of the biggest fears people may have about natural stone is the maintenance it requires. With the public increasingly turning to the use of natural materials in the home, granite has become the countertop of choice for today’s home owners. Synthetic solid surface materials are no match for the richness, depth, and incredible performance of real granite. Unlike laminates and solid-surface materials, a hot pot or frying pan has no effect on granite’s mirror-like finish. The diamond-like hardness of granite makes it virtually impervious to abrasions, stains and heat. (It’s important to note that granite won’t stand temperature stress such as fireplaces where the stone expands and contracts in very short period of time. The seams, however, will prevent cracks.) Most importantly, by choosing a granite countertop you not only give your kitchen everlasting performance and beauty, but you also increase the value of your home. You’ll find caring for your natural stone is easy. Warm water, mild dishwashing liquid, and soft clean cloth are generally all that’s needed to maintain your granite countertop surface. The best care you can give your natural stone is preventive care. 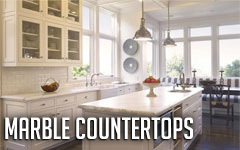 By following a few suggestions, your countertops will last a lifetime while maintaining a brand-new appearance. Avoid using cleaning products with any kind of acid or abrasive; they may cause de-colorations or scratches. Do not stand , kneel down on or sit on your countertops, as they could crack or break. Do not place hot pans or other objects directly on your countertops. This may cause discoloration (mainly in dark granites) and/or cracking. Always use a protective barrier between any hot object and granite such as trivet or mat. Granite countertops are surprisingly resilient to stains like citric acid, coffee tea, alcohol, or wine, and virtually impossible to scratch. However, as a preventive measure, wipe up any spills on the countertops within a reasonable amount of time and do not let liquid sit on the countertop overnight. It is important to note that granite is most prone to staining by oil. Be careful not to place any pots or frying pans with oil traces on the bottom on the countertop surface. Blot oil and acid spills as soon as they happen, and clean with mild soap and warm water to avoid any harm to your countertops. If the oil stains remain, there is a special cleaning procedure for the removal of deep-seated, time-set dirt and grime. A general poultice with baby or baking powder and water is the best remedy. First, moisten the surface of the granite with the same liquid that made the paste. Then apply the poultice paste to the granite surface about ½” thick. Tape plastic sheeting over the poultice area, and allow it to sit for 48 hours. Remove the poultice with a spatula, rinse the cleansed area with clean water, wipe off excess water, and allow the surface to dry. Granite tends to attract soap scum. Rinse with hot clean water on a regular basis and use a paper towel to dry. Another way to remove lime build up , soap scum, stains or dried spills, is to use a straight razor blade in a gentle scraping motion. Do not use lime removal products or cleaning products that contain ammonia, as this will affect the seal on the stone. For stubborn stains you can also use dry steel wool grade 00, or a no-scratch Scotch Brite pad to try to remove them. “Should natural stone counters be sealed? 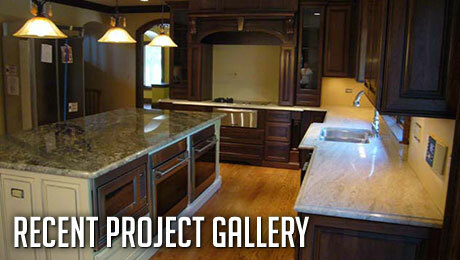 In many cases it makes sense to seal marble and granite countertops with a quality sealer. The product should have a life expectancy of ten to fifteen years and be of an oliophobic (resistant to water and oil based stains) nature. Once properly sealed, the stone will be more resistant against everyday dirt and spills. In today’s natural stone industry, many species of granite receive a resin treatment at the factory where the blocks of granite are cut into slabs and then polished. The treatment is used to fill microfissures, indentations and other minor characteristics that are found in many natural stones. The reason for the resin treatment is to address what most consumers consider as imperfections, but in reality are “birth marks”. The consuming public gravitates to perfection, defined as no “birth marks,” and so the marble and granite industry tries to fulfill the desire. Both resined as well as unresined slabs will outlast most of our lifetimes. Granite should, and in most cases will, be the last countertop surface a person will buy, providing a strong return on investment. The bottom line: Sealing resin treated countertops may increase the resistance of the already resistant nature of stone (adopted 11/8/06). Marble is an igneous stone that occurs naturally through the metamorphosis of limestone. It contains many different compounds, but consists mainly of calcium carbonate which gives marble its generally light and creamy hue. Colour variations in white marble are caused by impurities from other substances. In the stone trade, marble is defined by any crystalline calcitic rock capable of being used as a building material and taking on a shine. Today, marble is used primarily in bathroom vanities, fireplace surroundings, hearths, and tile stone. The trend of using marble for kitchen countertops is slowly increasing. Marble’s elegance and beauty gives any home an appealing quality. It provides a pure, graceful look. In terms of the care and maintenance of marble, the conditions that arise in a kitchen will undoubtedly leave marble stone damaged with stains, spots, etching (eaten/corroded/dull), and scratches. It will not stay pristine and will take on a natural patina fairly quickly. A honed or matte finish on marble is more resilient to etching and scratches. Honed marble is somewhat more user-friendly, and absorbs protective penetrating sealers more effectively with its porous openings. Polished marble is also slightly more resistant to staining. Marble must be re-sealed more often than granite. Sealant will prevent most stains, but it won’t prevent etching. Penetrating sealant ensures that spills remain on the top of the stone, radically reducing the rate of absorption into the countertop, giving you a small frame of time within which you can clean the spills without staining. The best warning that the marble must be re-sealed immediately is when water or other liquid fails to bead up on the surface, or if the stone darkens when water is splashed on the surface. Acid from substances such as red wine, marinara, sauces, dressings, vinegar, acidic fruits, and personal care products, can tarnish the look of the marble if left to sitting on the countertop. They will either seep into the pores, or react with the calcium in the stone. However, if the marble has been properly sealed, it will not stain instantly. If spills are wiped up as soon as they happen, and rinsed with warm water, most stains can be avoided. Never allow wet dishes, glasses, or water to stand on a marble countertop for any length of time. 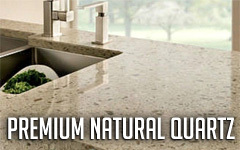 Clean countertops with non-acidic, pH-balanced (neutral) solutions, so as not to etch the surface. Use coasters with rubber or cork bottoms under all drinks. Use placemats under items that may scratch the marble surface. Use cutting boards for all chopping activities. Marble has been used for countertops, floors, and many other surfaces in Europe for hundreds of years. Many of these installations have a beautiful patina look. Some users prefer the daily wear and tear to show up on their marble countertops, as the marble grows better with age and takes on an amazing quality when it is worn out by time and use. Some argue that the patina look is worth it in the end. Marble is softer than granite, and while marble stains more easily than granite, it is a pristine working surface. It requires more vigilance than granite, but when properly cared for, marble will last a lifetime. If you are willing to spend a little more time caring for the surface of this stone, it can bring to your home a glint of the elegance and splendor that was once reserved only for nobility in their mansions and palaces. Our surfaces will keep their enduring luster and beauty for years to come, with minimal effort. Warm water and a splash of mild detergent is all that’s required to keep them looking their best, and to make things even easier – there’s no need to wax or seal. Caesarstone is more heat resistant than other stone surfaces including most granite, marble and limestone; and is not affected by temperatures lower than 150°C (300°F). However, like all stone material, Caesarstone can be damaged by sudden and rapid temperature changes. Life’s inevitable spills and stains can usually be cleaned up effortlessly with soap and water. More stubborn stains may require a putty knife or non scratch pad -leaving surfaces ready to be polished to their former brilliance. It’s important to be aware that like any other surface, Caesarstone can be permanently damaged if exposed to strong chemicals and solvents that can damage its physical properties. Never clean your Caesarstone surface with products that contain Trichlorethane or Methylene chloride, such as paint removers or strippers. Caesarstone quartz surfaces, just like other surfaces, can be damaged by strong chemicals and solvents. Don’t be tempted to use abrasive agents, such as oven or dishwasher cleaners on your surfaces. If they do come into contact with a non-recommended product, rinse thoroughly in clean water. If needed, apply a non-abrasive household cleaners (a non-abrasive cleaner will not dull the surface shine) and rinse to remove residue. To remove adhered material such as food, gum, nail polish or even dried paint, first scrape away excess material with a plastic putty knife and then use a damp cloth to remove any marks or residual dirt. For extra-stubborn stains, a no-scratch Scotch-Brite pad is recommended along with the non-abrasive cleaner recommended by your local Caesarstone distributor. It’s easy to keep your Caesarstone surfaces looking as perfect as the day they were installed. In the unlikely event you can’t find a solution to a problem or you are not sure whether you can use certain detergent on the surface, you’re welcome to contact your local Caesarstone dealership who will be happy to help.